Ocon took two more poles at Pau. © FIA. 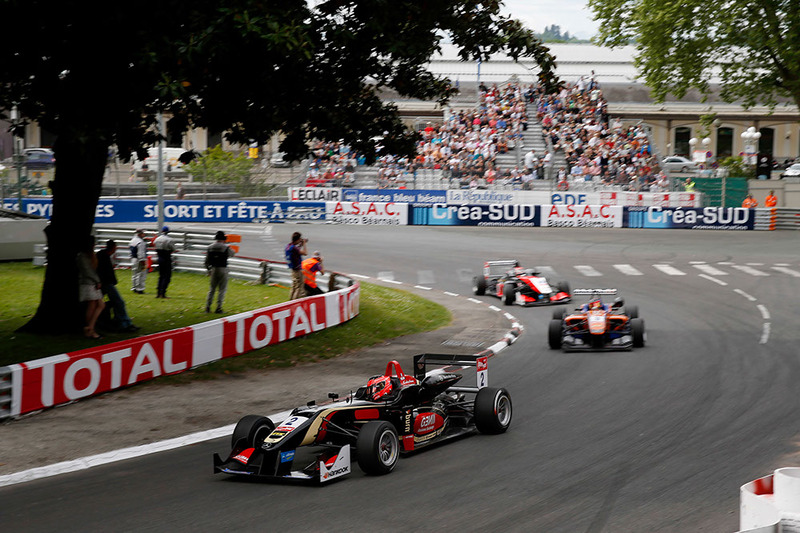 Prema Powerteam’s Esteban Ocon secured a double-pole series in today’s 2nd qualifying session for the 73rd Pau Grand Prix. The Frenchman will line up with yet another Mücke Motorsport car alongside him on the front row, with Felix Rosenqvist heading Max Verstappen (van Amersfoort). As with yesterday, Ocon and Verstappen dominated ‘Group A’ (for cars with even numbers). Where many in the first group registered laps in the 1’11-range, the leading pair were quick to break that barrier, with the French Ocon setting a 1:10.587 after eight minutes. Verstappen immediately improved on that time by two-tenths, only for Ocon to go another tenth faster on his following tour. Thereafter both drivers continued to improve their pace, but Verstappen was never quite able to topple Ocon – his best of 1:10.192s eventually proved too much for Verstappen who was a mere 0.057s shy of pole. Jake Dennis once again underlined his improvement by clocking up the 3rd fastest time. The Carlin driver spent almost the entire session following Ocon and Verstappen in the times, but was always several tenths shy. The Briton would eventually record a quickest lap of 1:10.647, earning Dennis a two-tenths advantage over Dennis van de Laar. John Bryant-Meisner, Ed Jones and Gustavo Menezes were the next fastest in ‘Group A’, while Tatiana Calderon assumed the 8th quickest time; however her session ended with four minutes remaining, when he clipped the barrier going through Foch. The temperatures dipped slightly for the second session. Both Rosenqvist and teammate Lucas Auer were immediately on the pace, with the former heading the times after eight minutes after registering a best of 1:10.767. Auer beat that effort by one-tenth moments later, only for Rosenqvist to pull together a tour two-tenths quicker upon his next tour. Rosenqvist went quicker still on his next lap, clocking up a circuit in 1:10.197; a time some three-and-a-half tenths up on the next quickest driver come the chequered flag. In the end, that would not be Auer. The Austrian hit a brick wall of pace in the final third of qualifying and could not improve on his top lap of 1:10.615; dropping Auer down to 6th in the group. Instead Tom Blomqvist (Jagonya Ayam Carlin) was the next man on the time sheets, following a late qualifying battle with Antonio Giovinazzi, Mitch Gilbert and Jordan King; all of whom jumped Auer before the flag. Following a good performance in the first qualifying session, Latifi could do not better than 7th, placing him above Felix Serralles and Antonio Fuoco in the order. Spike Goddard showed some positive improvements in this session and was running in the top-sic for a time; however a late session crash at Foch curtailed his running, giving the T-Sport mechanics much to do on a Saturday night. At this time, Ocon is on pole for race three, with Rosenqvist and Verstappen once again lining up behind the Frenchman. 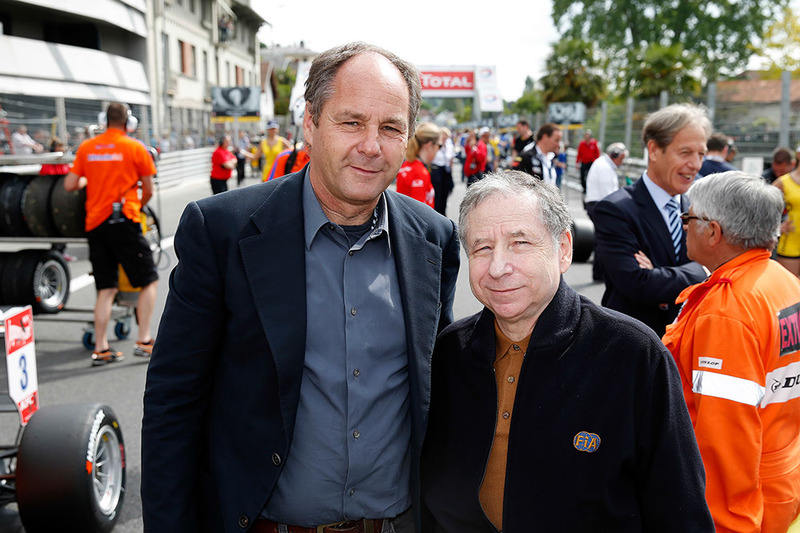 FIA President Jean Todt visited with FIA Single-Seater Commission President Gerhard Berger. © FIA.